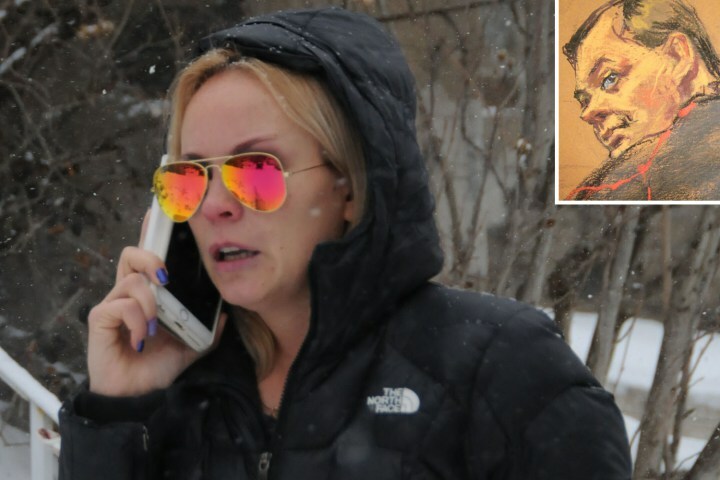 The wife of accused spy Evgeny Buryakov (court sketch, inset) talks on the phone after his arrest for allegedly trying to recruit successors to Anna Chapman. International lawyer Barry Grossman says the FBI’s claim of busting a spy network in New York City is a Washington’s propaganda ploy against Moscow, even as the US security apparatus engages in espionage activities across the world. The Federal Bureau of Investigation (FBI) said on Monday it has arrested three Russian spies, including Evgeny Buryakov who posed as a banker working for a Russian-owned bank in Manhattan, New York City. “This is a storm in a tea cup. It’s almost laughable. It is a propaganda ploy that is reminiscent of the way some officials accept bribes in banana Republics to criminalize individuals on the orders for their adversaries,” Grossman, who is based on the Indonesian island of Bali, said in a phone interview with Press TV on Tuesday. “In this instance, three Russian men are supposedly charged with spying without a license; that is they are accused of gathering what might be loosely called low grade intelligence without registering as agents of a foreign power, even though two of the three – who were low level diplomatic staff – are no longer in the United States but were in fact registered as agents of a foreign power at the relevant time,” he added. The FBI claimed that Buryakov was an agent under nonofficial cover, collecting economic intelligence for Russia’s foreign intelligence service, the SVR. “The man currently in custody had committed the ‘heinous crime’ of doing a Google search related to US sanctions against Russia and an unclassified Treasury Department memo was found on his computer which listed Russian banks to be targeted in future sanctions; that hardly seemed to be what anyone would consider spying,” Grossman said. “By way of comparison, a former CIA officer was convicted on espionage charges Monday, for telling a journalist about a secret operation to sabotage Iran’s nuclear energy program,” he added. Jeffrey Sterling, 47, who was involved in the CIA’s covert operation aimed at hindering the progress of Iran’s nuclear energy program over a decade ago, was charged under the Espionage Act for revealing classified information about the CIA black op to a New York Times reporter and author. “If somebody dares to blow the whistle on such illegitimate and criminal US activities, they are imprisoned while the perpetrators are awarded medals,” he noted. “Meanwhile, anyone who does a simple Google search on a sensitive subject can be prosecuted by the United States for being a spy, while the US security apparatus [itself] works with their equivalents in various other nations to spy on us all and, when deemed useful to some agenda, they reel us into prosecution using bizarre long arm jurisdiction legislation which they even assert against non-Americans who have no connection with the USA,” he stated. “We have really stepped through the looking glass. The US security apparatus is now entirely unaccountable and does whatever it likes, be it for private or political objectives. It does in a way which makes Orwell’s worst predictions and Kafka’s worst nightmares seem like a utopian dream. This is the pure lunacy,” Grossman concluded.